Getting started on Bible journaling doesn’t mean you have to spend a lot of money. To begin, you can use an ordinary journal. Lifeway had some beautiful ones for only $5 and less. It doesn’t have to be anything fancy and you don’t have to purchase a journaling Bible right away. I really LOVE my Journaling Bible, but I began in a plain journal and used a lot of scratch paper before I started to try any handlettering or art in my Bible. Everyone begins somewhere. One group of gals from the event last night was simply working on their handlettering. They weren’t drawing or painting or stenciling or stamping. They were choosing words to highlight and beginning to learn to offer their lettering as worship to the Lord. One of the women wasn’t doing any lettering at all, but had an older Bible that she wasn’t using as much since she got a newer one. So in her older Bible, she was using watercolor pencils. She inspired me to want to try watercolor pencils, even though I’ve stuck with colored pencils for months now. The Bibles pictured above were ones that folks brought along with them to the event. My encouragement to you is that if you are not an artist and you’ve never really worked on drawing or painting or artistic work at all (like me! ), then start with what you have and take it one step at a time. One of the ladies at the event is a beautiful artist and her suggestion was to purchase one art medium, whether watercolor pencils or paints, or colored pencils or a new box of crayons! Work with it until you are comfortable and need a new challenge. Because I’ve become infatuated with beautiful hand-lettering over the past few months, I enjoy sharing the resources I’ve found for practical guidance and inspiration. I haven’t practiced the lettering alone nearly as much as I would like, but I’m hopeful that I can continue to build on what I’ve learned so far. Made by Marzipan has a free beginner’s guide to handlettering and some YouTube videos to help you learn the basics. Two books that I have enjoyed on this topic are: The Art of Whimsical Lettering and Creative Lettering and Beyond: Inspiring tips, techniques, and ideas for hand lettering your way to beautiful works of art (Creative…and Beyond) Instead of purchasing the books, one option is to borrow them from your local library. If you love hand-lettering, LissLetters is a Jesus-loving girl whose Instagram videos are addicting. She is so incredible! Lifeway has a fabulous sale on the Bible Journaling kit this month at $10 off the normal price. Check out my Periscope video below for the scoop on the art supplies included in the kit. This kit is only available in stores and not online, as far as I know. Journaling Bibles & New Releases! 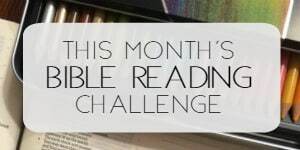 My analysis of journaling Bibles has not changed since this post where I chat about my favorites. 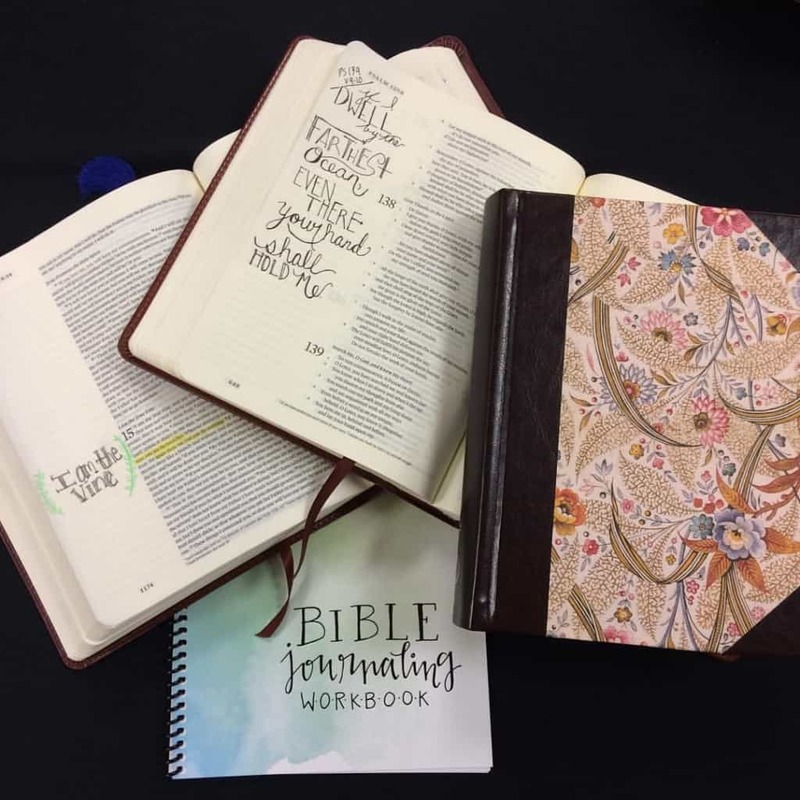 However, there are some great new releases coming soon in the journaling Bible department. 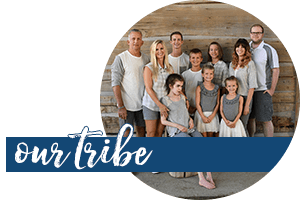 The Inspire Bible includes wide margins like a journaling Bible, but the some of the margins already have black and white images that you can color, similar to an adult coloring book. The New Living Translation is releasing February 1, 2016 and currently is the #1 new release in Bibles on Amazon! The release date on the above two Bibles is February 1. Yesterday Lifeway also offered a sample packet of this beautiful new Bible pictured below, releasing February 2, 2016. 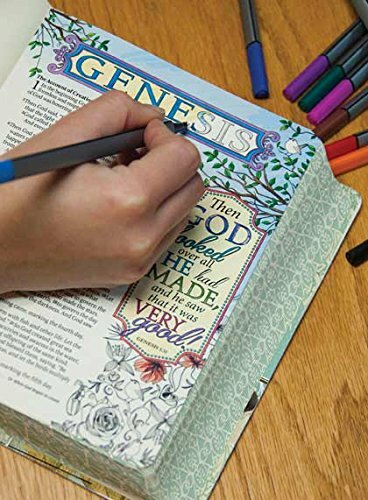 If you love art, but prefer to enjoy it visually rather than creating it, then this Beautiful Word NIV Bible is for you! With 500 verses illustrated to help you see the rich diversity of stories, characters, prophecies, rewards, and hope contained within Scripture, you will discover wisdom to sustain you in every season, drawing you deeper into God’s life-changing and inspired Word. 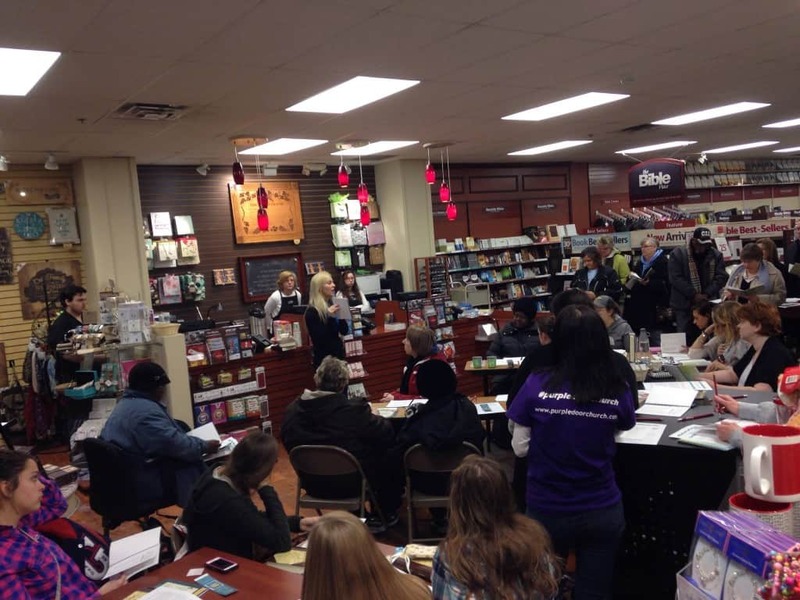 Lifeway Christian Bookstores will price match to any online or retail store for exact product codes!! And don’t forget they offer fabulous coupons at 30% and 40% off at various times!! So be sure you are receiving their emails to take advantage of these fabulous savings!! If you have some items you’re wishing for from the above suggestions, then this is a great way to fit those into your budget. 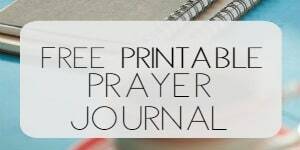 Lifeway offered a free Bible Journaling notebook and graciously they are offering this as a free pdf download! So you can head over to the Facebook page of the Columbus West store where I was and download the notebook to get you started on your Bible journaling journey! I also passed out copies of my How-To Bible Journal Guide and of course, signed copies of my latest release, One More Step: Finding Strength When You Feel Like Giving Up. 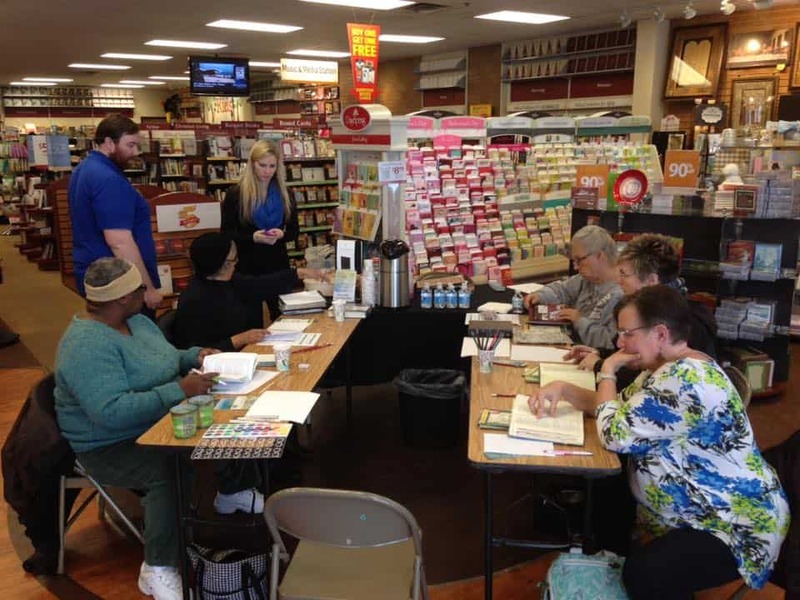 And that is a wrap-up of what we discovered together at the Bible Journaling Session at Lifeway yesterday! It really was fun and I’m hopeful they will offer more sessions in the future. 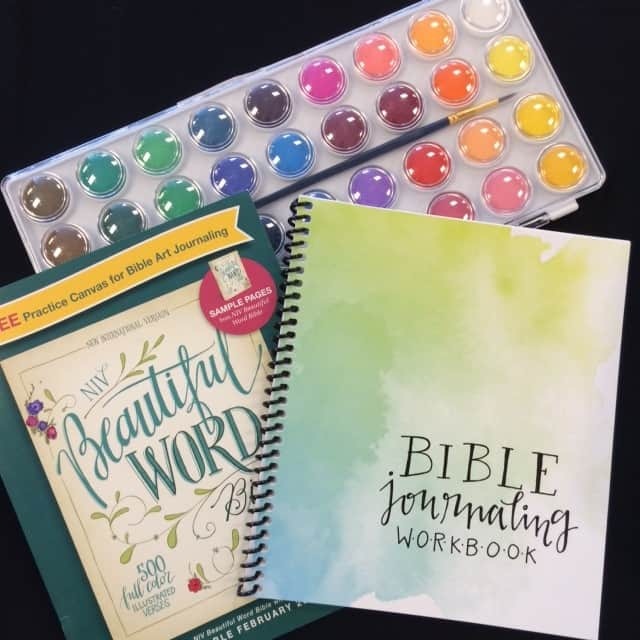 I recently updated my speaking page and if you’d like to include a beginner Bible journaling coaching session with hands-on Bible study and art supply testing, just make a note in the comment section of the request form! You’ll find the Bible Journaling templates I used to teach the Spring 2016 Bible Journaling Workshop here. Hope you enjoy and we’ll chat soon! Post includes affiliate links; site may be compensated if purchase is made. See full disclose policy. Rachel, I can’t get the link to work to download the free bible journaling notebook. Thank you for any help. It says this is blocked. Just emailed it to you, Jennifer! And God will look down and say “Well done, my good and faithful servant!” Keep going, Girl. Hi Rachel, I cannot get the link to open for the free Lifeway Workbook, can you help please? I emailed you, Eileen! Hope it helps! I wish we have Life Way in the area where we live. We only have 1 local Christian bookstores. Praise God for you and Life Way to open doors for the people who wants to learn more about this Bible Art Journaling. NLT is my most favorite Bible ever! 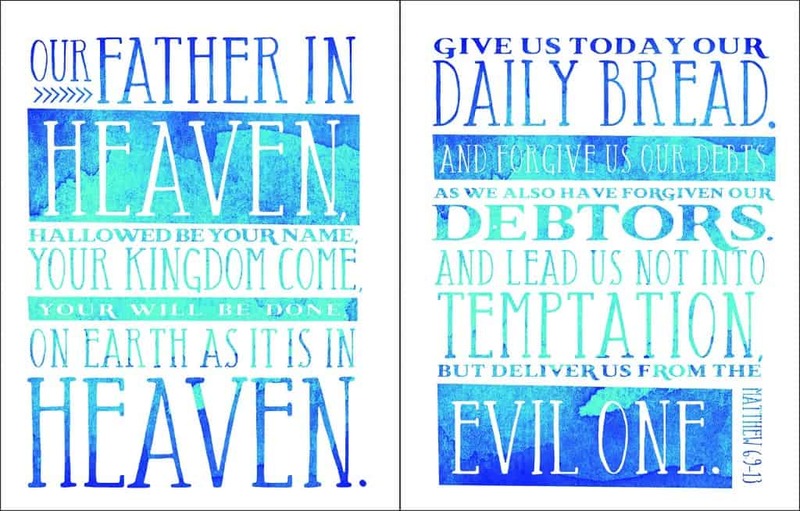 And super excited to get my hands on their new Inspire Bible Art Journaling soon! Except that the HCSB Journaling is no longer available only the notetaking one. I’m hoping they are just revising it. Holly- I noticed there was a change in the label and so I compared my “Journaling Bible” to the “Notetaking Bible” Exact same layout! I think they just realized that it is a great Bible for either and so they thought “Notetaking” would make sense to anyone who wanted to take sermon notes or use it for their Bible study notes. Thanks, Jennifer!! You’re so kind. God is good. Emailing you now!! Not sure if you were able to read my note, but I wanted to share with you again, since you do such great work and provide wonderful resources on journaling. How fun, Janet! Thank you for sharing! I hope many in your area will enjoy God’s Word in a new, fresh and exciting way! 🙂 Blessings to you! I’ve emailed you, Lisa. Let me know if you have any more problems! Rachel, I am so blessed to find your site and see all the helps you have here. 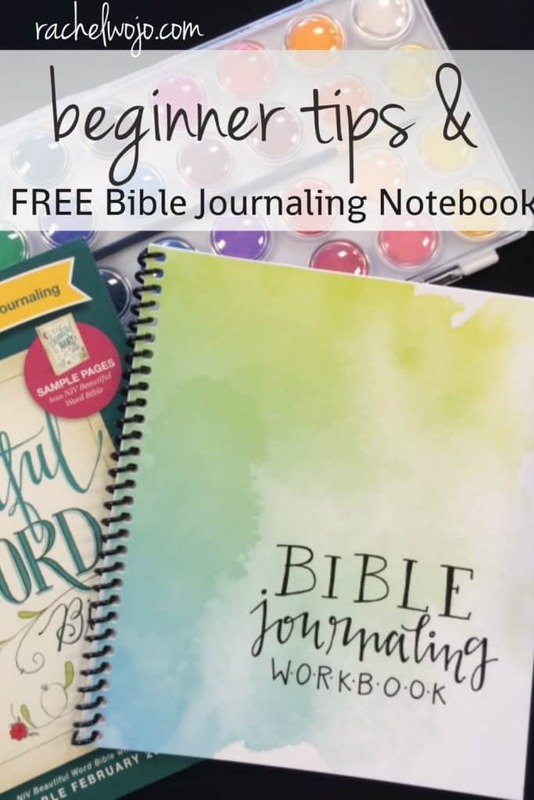 I really want the free Beginner Tips and Free Bible Journaling Workbook but I can’t even find the link. Help.